In the year 2007, lot of retail investors saw how the markets gave such phenomenal returns for their neighbours and began to invest most of their money into buying stocks. I too invested in many mutual funds & stocks in the last 3 months of 2007 – more than Rs. 100,000. 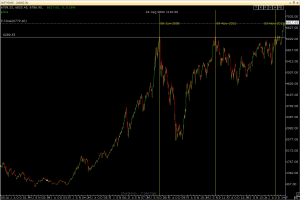 January 2008 came and the markets saw the biggest fall and before the year ended, it hit the low of almost 2600. Many retail investors lost money they had put in and the markets didn’t see the previous highs until the year 2010, but then again faced a correction. But it was just the index which had performed well and people who had invested in lot of individual stocks got their wealth eroded. Most mutual fund investments were also in the red and there was no other option than to wait or book losses. I waited and it was only in end of 2013, that the markets attained new highs and now there is a pre-election rally that is going on hopes of a stable, business friendly government. So now that the markets are making new highs, what about the investments I made? How much profit I made? In most mutual funds I had gotten back all the money I had invested with maybe 1% returns (mostly even less). Few stocks I made a profit and there are many other companies that have gotten so low that it costs more money to hold them in my DeMat account than if I sold it today. What was the mistake I made? All my investments during the 2007-2010 were all done in lump sum. One of the mutual fund agent (a friend’s father) had advised me to go for the SIP route as my cost would average out if any corrections happened. But me and my father decided against it and ended up putting all the money in lump sum. That was a very costly mistake. You may ask “You got back your money in the funds you put in right? You didn’t lose anything.” No, remember the effect of inflation. Even though I got back all my money, I lost 6 years. And the Rs.1 Lakh I had in 2007 is worth much more than the Rs.1 Lakh I got back in 2014. Imagine me investing the Rs.1 lakh in a bank fixed deposit and letting it grow for the 6 years. It would have nearly doubled in the 6 years. I lost the potential to grow that 1 Lakh to 2 Lakhs. This is the case for many such retail investors who got into the market at the near top, they are now only seeing absolute returns of about 6-7%, that too for 6 years. It is common to make mistakes, but if one learns from it, it was worth it. My mistake cost me a possible return of nearly Rs.1 lakh and I learnt this valuable lesson. I am giving you this lesson for free, so that you don’t make the same mistake. If you are investing in the markets via mutual funds or in the index via ETF, always use the systematic investment plan (SIP) option. It is easier on your pocket as only a part of your salary goes into the investment and you also get the benefit of Rupee Cost Averaging. You are protected against the market volatility and since no one can time the markets, it is best to let math decide your average cost. Remember this as a rule. 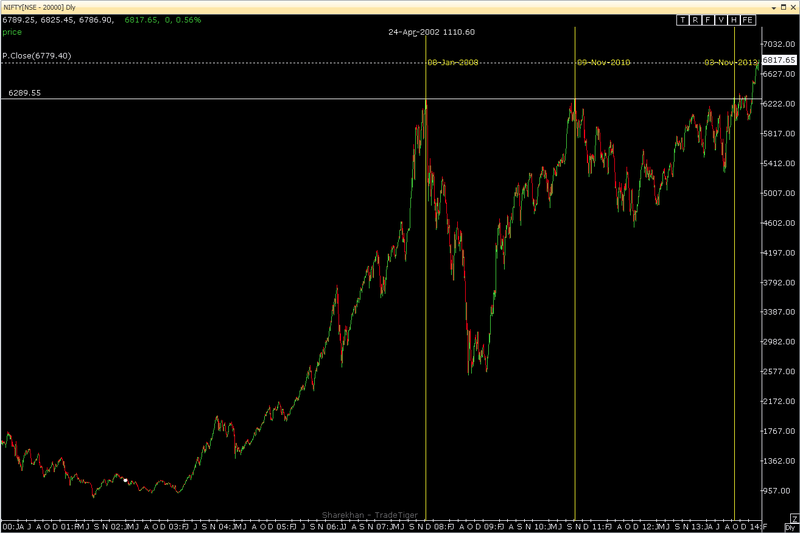 If I had used a monthly SIP for my investments, even starting in the highs of 2008 would only be profitable for me. With the bear market and various corrections again from 2010, I would be able to sit on a much bigger profit than what I would’ve gotten in bank FDs, not to mention what I earned in the lump sum investments. Remember, you can’t make all the mistakes in the world. It is much easier (and cheaper) to learn from other’s mistakes.